The Michigan Physics Olympiad for High Schools in SE Michigan and vicinity took place on Saturday, May 9th, 2015. The 2015 winners are posted here. Long-range homonuclear diatomic nD-5S Rydberg molecules photoassociated out of an ultracold gas of Rb-87 atoms were observed. The measured ground-state binding energies are larger than those of their nS-5S counterparts, showing the dependence of the molecular bond on the angular momentum of the Rydberg atom. The molecules transition from a molecular-binding-dominant regime at low prinicipal quantum number to a fine-structure-dominant regime at high prinicipal quantum number [akin to Hund's cases (a) and (c), respectively] ( Preliminary report ). Ion imaging methods have been used to measure the Rydberg-Rydberg correlation function with unprecedented sub-micron resolution. The Rydberg excitation blockade was characterized in cold-atom clouds as a function of laser detunings and, for the first time, within spatially-varying light-shift potentials. 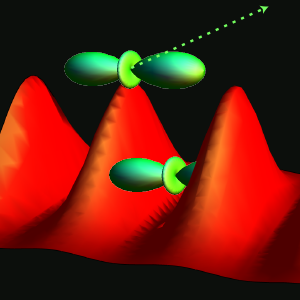 Evidence of direct two-photon excitation of Rydberg atom pairs was seen in several circumstances ["Spatial correlations between Rydberg atoms in an optical dipole trap," A. Schwarzkopf, D. A. Anderson, N. Thaicharoen, G. R., Phys. Rev. A 88 , 031401 (2013) (Rapid Comm., Editor's suggestion)]. Using an optical lattice as a spatially sensitive probe, we have measured directly that Rydberg atoms photoionize at the nucleus, and not where the electron is most likely to be found. This validates the electric-dipole approximation, which applies in this case despite the fact that the atoms have about the same size as the optical wavelength ["Ionisation of Rydberg atoms by standing-wave light fields," S. E. Anderson and G. R., Nature Communications 4 , Article number 2967 (2013). ]. 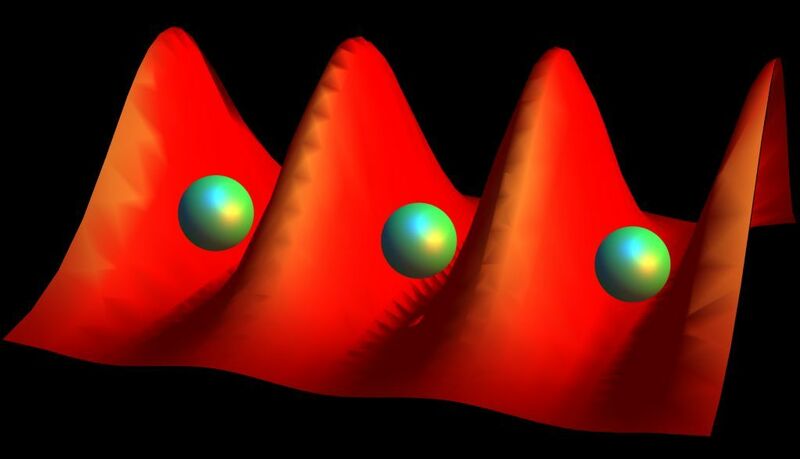 Laser-cooled, circular-state Rydberg atoms with magnetic moments of 57 Bohr magnetons were produced and magnetically trapped for the first time. [ Phys. Rev. A 88 , 031401 (2013) (Rapid Comm., Editor's suggestion)]. Artificial crystals of thousands of 200nm-diameter nanoparticles were trapped in an optical lattice in aqueous solution. The Bragg scattering and Brownian motion behavior was studied [ Phys. Rev. E 87 , 052311 (2013)]. Movie 1: 3D crystals of 300nm PS spheres. Movie 2: 3D crystals of 190nm PS spheres. We have explored and explained the multifaceted fate of Rydberg atoms in long, magnetic atom guides Phys. Rev. A 87 , 053418 (2013) . A novel type of non-degenerate, highly polar, magnetized Rydberg states was characterized Phys. Rev. A 87 , 012505 (2013). Rydberg atoms were trapped with 90% efficiency in an optical lattice. The lattice uses the ponderomotive force that acts on the quasi-free Rydberg electron. For detailed results, see Phys. Rev. Lett. 107, 263001 (2011). 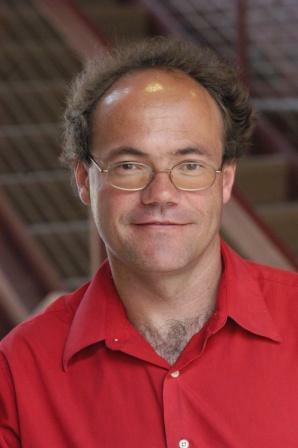 A brief news report has been published by the University of Michigan News Service. 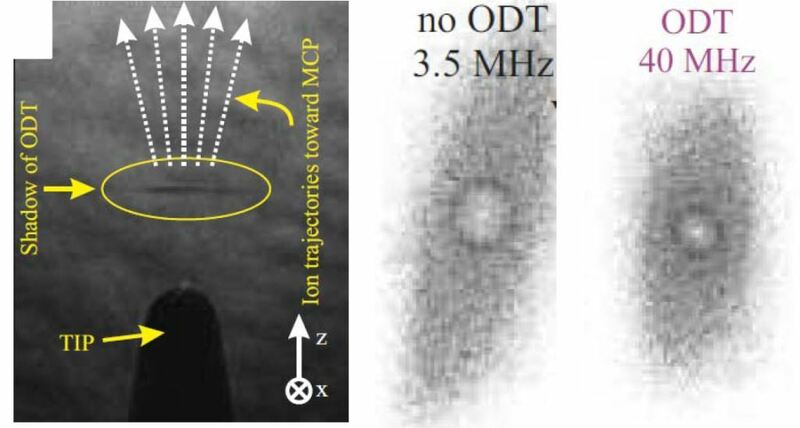 Direct spatial imaging of the Rydberg excitation blockade was accomplished for the first time [Phys. Rev. Lett. 107, 103001 (2011)]. <prev start stop next> Welcome to the slideshow! If you see this message, your browser does not display the slideshow. Try enabling scripts in your browser.